Released in 1979, Going in Style revolved around a trio of retirees who break the monotony of their dreary daily lives by robbing a bank. That critically-acclaimed, comic caper co-starred a trio of entertainment icons in George Burns, Art Carney and the legendary Lee Strasberg, the father of method acting. Ordinarily, one would think twice before mounting a remake of such a beloved classic. Not Zach Braff (Garden State). Despite the daunting challenge, the ambitious actor-turned-director decided to give it a go. First, he turned to Oscar-nominee Theodore Melfi (for Hidden Figures' screenplay). Melfi came up with a terrific script only loosely based on the original. He retained the main characters' names and the basic "bank heist" premise while updating the dialogue and overhauling plot to yield a rollicking, laff-a-minute adventure. Second, Zach retained the services of Academy Award-Winners Morgan Freeman, Michael Caine and Alan Arkin to play the leads. Although 79, 84 and 83, respectively, these reliable, accomplished thespians generate an endearing camaraderie and deliver every punchline with perfect timing. At the point of departure, we find Joe (Caine) in the midst of complaining to an unsympathetic loan officer (Josh Pais) about Williamsburg Savings' impending foreclosure on his home when the place is suddenly held-up by a gang of masked men. 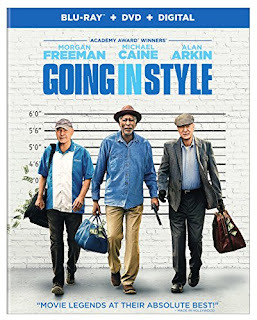 Later that day, while commiserating with former co-workers Willie (Freeman) and Al (Arkin), Joe realizes they've all fallen prey to the bank's shady practices which includes completely draining the pension fund they're all dependent on. But instead of alerting the authorities, the victims opt to take the law into their own hands, conspiring to retrieve at gunpoint precisely the same amount "stolen" from them. Of course, the hold up proves easier planned than executed, given that this is each of these geezer's first felony. Fortunately, the BFFs are not to be deterred, even after a disastrous dry run shoplifting at a supermarket. What's bad for them is great for the audience, as the laughs just keep coming clear through the closing credits. You can't ask any more of a madcap comedy than this much hilarity! Blu-ray/DVD Combo Pack Extras: Deleted scenes; and director's commentary with Zach Braff.